"Take Your Tarot Readings To Powerful New Dimensions"
Tarot Prediction and Divination is designed to bring more depth and power to your readings as it explores the three dimensions of the Tarot: divination, therapeutic, and spiritual. 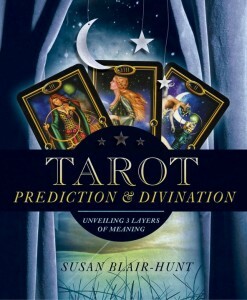 Internationally respected Tarot expert and author Susyn Blair-Hunt presents an original, step-by-step approach, using the Tarot's visual cues as a means to awaken your psychic abilities and help you discover the predictive, therapeutic, and spiritual messages hidden within the cards. If you’re just setting out on your journey into the Tarot, you’ll find everything you need to get started. Have a little more experience under your belt? You can use this guide to expand your abilities, refresh your perspective, and take your interpretive skills to the next level. With 15 original layouts, 45 sample readings, and a series of informative correspondence charts, you’ll learn how to draw additional insight from the Tarot to make your readings more effective and profound. Compatible with any Tarot deck, Susyn uses visual literacy and expanded meanings to add more versatility to your readings. The sample readings included with each layout reveal how to extract the predictive, healing and spiritual messages of each card. When you combine these three dimensions of the Tarot, you’ll perform the most effective and accurate readings possible.